In stock -This product will ship today if ordered within the next 4 hours and 49 minutes. Living Nature Firming Flax Serum is a potent, oil-free serum for firmer, smoother skin. More powerful than aloe vera, the Harakeke Flax Gel in this Serum is a mild astringent, causing your pores to contract, preventing your skin from losing moisture for fewer fine lines and wrinkles. With active manuka honey as a nourishing humectant and rosehip oil to rejuvenate the skin, Firming Flax Serum is nature`s wrinkle defence. This serum is suitable for all skin types. Aqua (water), Simmondsia chinensis (jojoba) seed oil**, Cetearyl olivate, Sorbitan olivate, Vitis vinifera (grape) seed oil, Caprylic/Capric triglyceride, Glucose, Mel (manuka honey), Phormium tenax leaf juice (NZ flax gel), Sclerotium gum, Calendula officinalis (calendula) extract**, Euphrasia officinalis (eye bright) extract, Parfum (fragrance)*, Daucus carota (carrot) extract, Rosa canina (rosehip) fruit oil**, Triticum vulgare (wheat) germ oil, Oenothera biennis (evening primrose) oil**, Glucose oxidase, Lactoperoxidase, Tocopherol (vitamin E), Hypericum perforatum (st johns wort) oil. *From natural essential oils: Limonene, Linalool. **Certified organic. Each morning and evening, smooth onto face and neck after cleansing and hydrating; pay attention to areas such as expression lines. Follow with your moisturiser. Below are reviews of Living Nature Firming Flax Serum - Harakeke & Rosehip Oil - 13ml by bodykind customers. If you have tried this product we'd love to hear what you think so please leave a review. 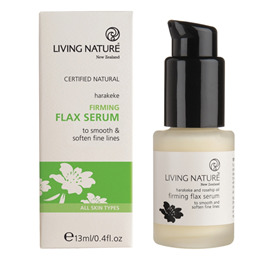 Living Nature Firming Flax Serum is a potent, oil-free serum for firmer, smoother skin. The Harakeke Flax Gel in this Serum is a mild astringent, causing your pores to contract, preventing your skin from losing moisture for fewer fine lines.